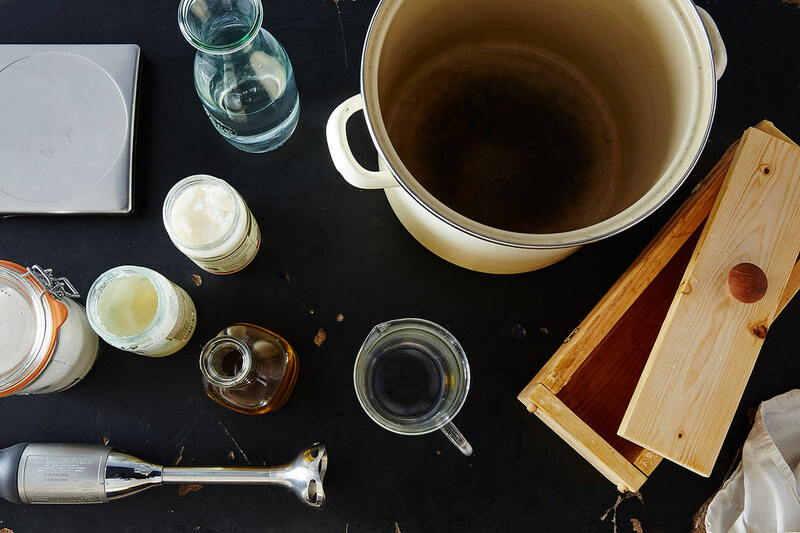 With a few tools and some knowledge, soapmaking is no harder than most cooking projects we take on—and the results are well worth it. Once you have a base recipe down, you can play with fragrances and customize your own soaps. *Any tools that touch lye should NOT be reused for cooking! The lye now needs to cool to below 100° F. I usually place mine outside on my porch to speed up this process. Depending on how cold out it is, it can take between 30 and 90 minutes for the lye to cool, which is why I recommend doing this step first. 2. Prepare the mold and measure out fragrance. 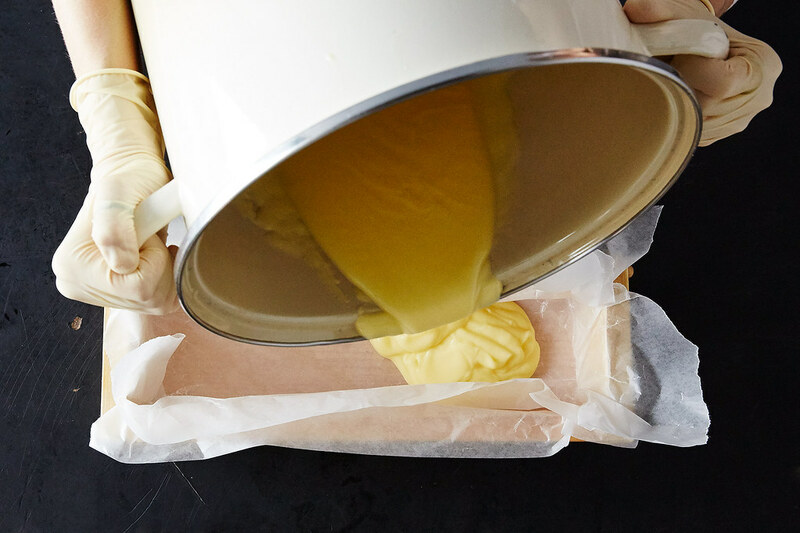 If you’re using a wooden loaf mold or a baking pan, carefully line the inside with waxed paper or parchment paper to make the soap easy to remove later. I often use some masking tape to help hold everything in place. 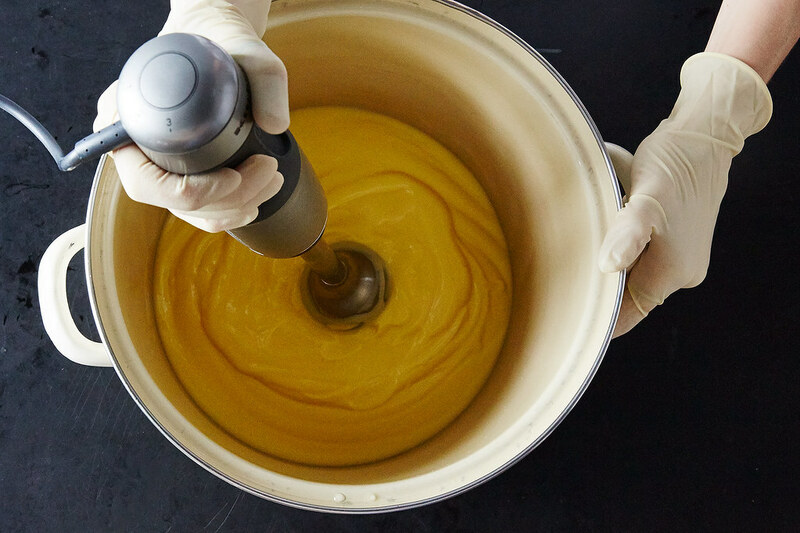 If you use a silicone mold, you can skip this step. If you like the simplicity of plain rectangular soap bars and think you’ll make more than a couple batches of soap, having a wooden loaf mold like the one shown here makes the process easy and consistent. (I’ve found eBay and Etsy to be good sources for wooden versions at lower prices.) Other options include silicone and PVC plastic molds, which come in many shapes and patterns. If you’re not ready to invest yet, a 9 by 12-inch baking pan that your kitchen is willing to part with should also work just fine for this recipe. Now is also a good time to measure out your essential oils into an extra measuring cup, for ease of adding them later. Blending fragrances is one of my favorite parts of soapmaking. For this batch, I used 5 teaspoons of orange essential oil and 2 of sandalwood. Synthetic fragrance oils also work well and are generally less expensive than pure essential oils. You can also opt to make unscented soap and simply leave this ingredient out. 3. Melt and mix the oils. You can now prepare the blend of oils to which you’ll add the lye. If you’re using oils that are solid at room temperature, such as the coconut and palm oils in this recipe, you’ll first need to melt them so they can be poured, either by placing the container in a saucepan of simmering water or by melting them in the microwave. Once your oils are in a liquid state, place your large pot on the scale and weigh (or re-weigh, if you’ve already done so) the each oil into it for precision. Stir everything together and then check the temperature with a heat-safe thermometer. For the next step, the oils need to be between 80 and 100° F. I often find that mine are already in the correct range from being melted, but if not, place the pot on the stove over low heat until the oils reach the proper temperature or set aside to cool down. 4. Blend and pour your soap. When both your lye and your oil mixture are between 80 and 100° F, you’re ready to blend. After removing the pot from the heat to a trivet or heat-safe surface, put your gloves and eye protection back on and carefully pour the lye into the pot of oil. They’ll begin to react with each other, turning the mixture cloudy. Begin blending with your immersion blender, and over the next 3 to 5 minutes you’ll see the mixture become thicker and more opaque. You’re aiming for a mixture with the consistency of a runny pudding. If you lift the blender out and let some drips fall across the surface of the mixture, you should see them leave a visible pattern, called “trace,” before sinking back in. Once the soap mixture has reached trace, stir in the fragrance oil, if using, until blended. Carefully pour the finished mixture into your lined soap mold, and cover with the lid (or plastic wrap, if your mold has no lid). Being sure to keep it level, wrap the whole thing in a towel or blanket to insulate it, and leave undisturbed in an airy out-of-the-way place like a shelf for 24 hours. Your work is now done, but the bars need to cure for 4 to 6 weeks before being used. This time allows the water in the bars to fully evaporate, resulting in a harder and milder soap. Leave the soap to cure on a paper bag or baking rack in the same airy location. If you use a paper bag, turn the bars once or twice during the curing time to make sure all sides are exposed to air. The pitcher, measuring cup, and spatula just need to be thoroughly rinsed with water. For the pot with raw soap residue in it, I usually wipe it out first with paper towels before washing it with dish soap and water. 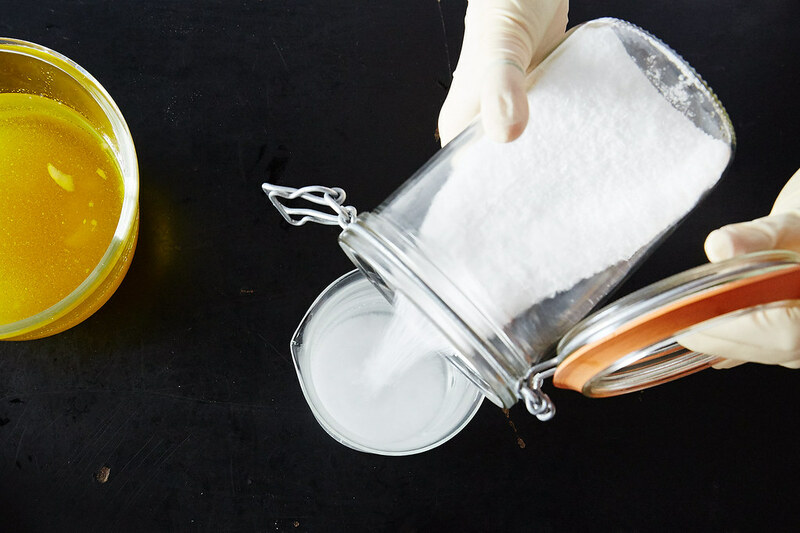 Use any tools that touched the lye only for soapmaking, and store them away from the kitchen to prevent any chance of confusion. 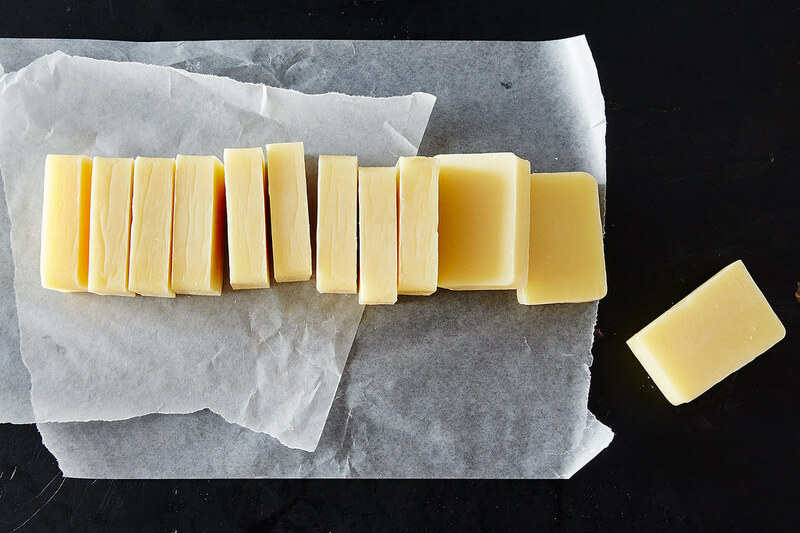 This recipe is only one of practically endless combinations and ratios of fats, lye, and other ingredients that you can use to make soap. A lot of the fun of soapmaking is in exploring new recipes and seeing what turns out. Some of my favorite combinations have been orange and sandalwood with poppy seeds, lavender and clary sage with dried lavender blossoms, and rosemary and cedar wood with dried thyme. 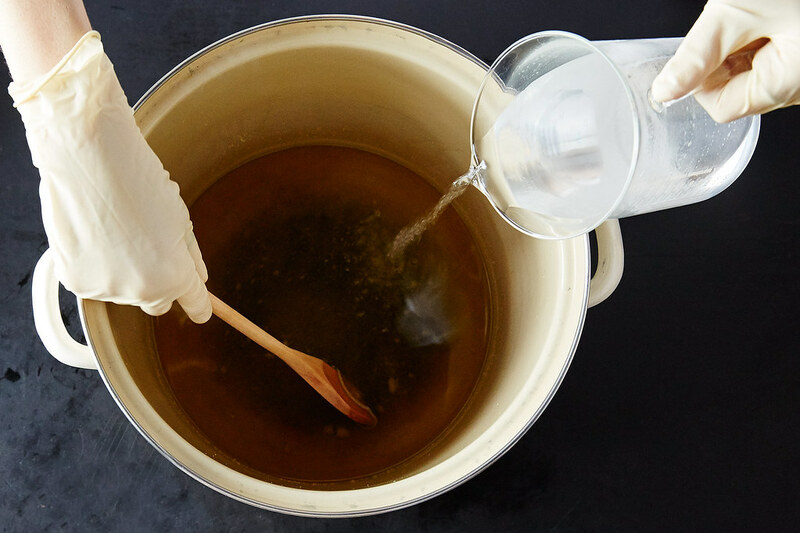 You can also change the ratios and types of fat to make soaps with different properties, as well as using liquids other than water (such as milk). Online oil charts and lye calculators can help you finish your recipe. The proportions for this particular recipe are taken from Susan Miller Cavitch’s The Soapmaker’s Companion, a good all-around resource for learning about the science of soapmaking, exploring options for ingredients and techniques, and troubleshooting problems. Congratulations, you’re a soapmaker! Get creative, be safe, and have fun.